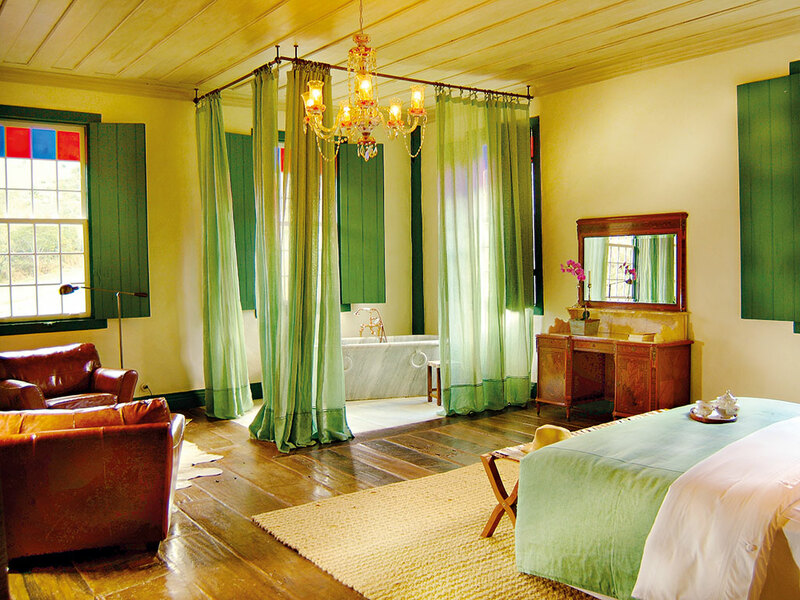 A stay at Reserva do Ibitipoca allows you to feel like you have gone 100 years back in time. The beautiful lodge, which was once the main house at Fazenda do Engenho (‘Engenho’s Farm’), is an authentic 18th century farmhouse, sitting at 2,950ft above sea level amid some of Minas Gerais’ most stunning forests and parks. Founded in 1981, the reserve’s ultimate goal was to expand the wildlife corridors connecting the lodge to Ibitipoca State Park; a 1,488-hectare forested park made famous by its landscape of cliffs, rocks, natural bridges, caverns and waterfalls. Reserva do Ibitipoca’s aim continues to be the reforestation of native flora species, and to provide larger spaces and better conditions for the reintroduction and reproduction of wild animals that are indigenous to the region, but that are now endangered. In 2008, the hotel was opened on the site in order to bolster economic growth in the region, allowing the reserve as a whole to become a truly sustainable project. Since then, the hotel has welcomed people to explore the reserve’s 4,000 hectares of natural and historical wealth, while remaining in touch with the local population. Reserva do Ibitipoca rejects the traditional feel of a hotel, as it prides itself on being much more than that: the reserve feels more like a home, with eight rooms each decorated with local handicrafts, one-of-a-kind furniture and a series of luxury amenities, including underfloor heating and Victorian baths, to make guests feel truly welcomed. However, what really stuns guests during every stay is the experiences that can be had there: being greeted by a warm reception, customised treatments, candles and rose petals in each bedroom, marvellous food and unforgettable well-being treatments at the hotel’s spa are just some of the features that await guests upon arrival. A particular attraction is the traditional mineira cuisine. Breakfast at Reserva do Ibitipoca is an invitation to taste foods typical of the land, with all meals being produced at the hotel itself. Lunch is served from the hotel restaurant’s wood-burning oven and can be enjoyed next to the nearby waterfall. Dinner is the truly special daily event, and can be served in a variety of exotic locations, including underneath one of the hotel’s magnificent Jabuticabeira (Brazilian grape) trees. Every meal is delicious, locally produced and lovingly prepared by some of the hotel’s 50 employees, all of whom are members of the Ibitipoca community. Reserva do Ibitipoca offers guests a series of once–in-a-lifetime opportunities that allow them to get closer to nature and local attractions. All tours are conducted by local guides and can be done on foot, by bike or on Mangalarga horseback. The different trails range in length from 2-57km, passing by waterfalls, breathtaking views at heights of up to 4,920ft, and natural pools made distinctive by their ‘Coca-Cola water’ – water that is reddish in colour as a result of the decomposition of nearby plants and the presence of iron compounds. The reserve and its hotel are both increasing in popularity due to their uniqueness as a destination. 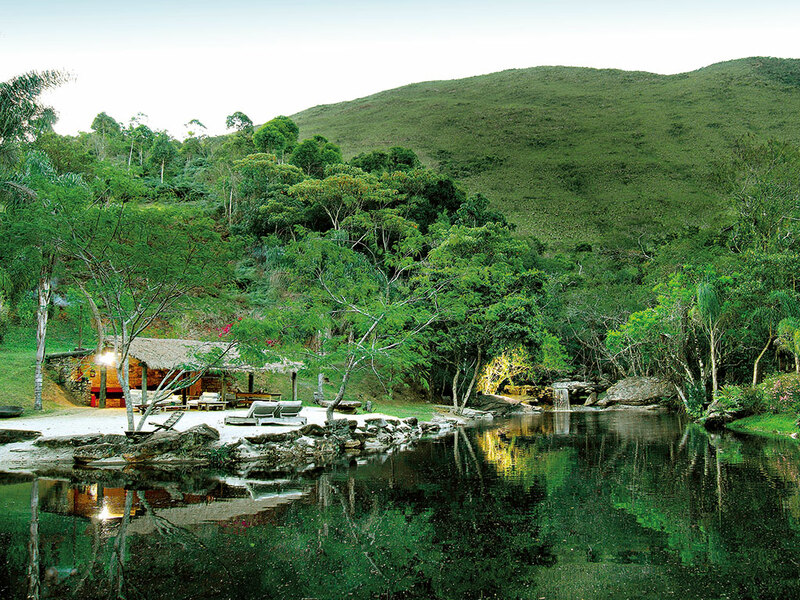 Reserva do Ibitipoca’s customised itineraries and incredible service, combined with top notch amenities, stunning nature and contact with the local community and culture, make for an incredible stay in the peaceful scenery only 167 miles from Rio de Janeiro. The hotel’s exclusivity makes it the perfect spot for a honeymoon, a relaxing finale to an exciting trip to Brazil, or an ideal stopover during a road trip through the colonial towns and cities of Minas Gerais.